The newly-renovated and uniquely-reimagined dining experience at La Loma Village is designed to exceed all expectations. A diverse and dynamic menu promises to delight with resort-quality food prepared fresh by exceptionally talented Chefs. With such a wide selection of entrée and dessert options, there’s sure to be something to delight every taste palate. Gluten-friendly options and health-conscious fare, such as low sodium and low sugar menu items, help the dining experience accommodate a wide range of dietary preferences. Ample portions of breakfast, lunch, and dinner are available daily with a flexible and convenient dining program. Families and friends are invited to dine with residents and may reserve a private area for birthdays, anniversaries, and other special occasions. It’s the perfect way to share the premier dining experience of La Loma Village with the ones you love. 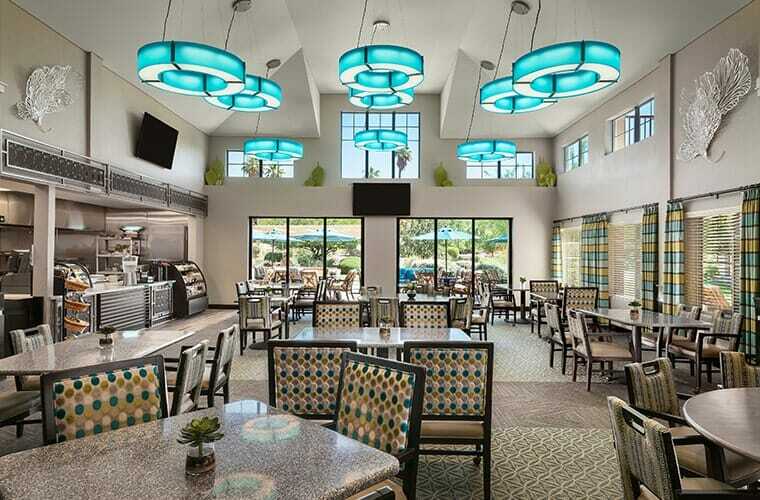 The Sonoran Dining Room serves as a main hub of La Loma Village’s dining offerings. Rotating menus consist of Chef specials, soups, salads, and daily staples designed around a variety of world cuisines. Monday – Saturday: 11:30 a.m. to 6:30 p.m. The Atrium Café is the perfect place for residents to gather and enjoy a full menu of delicious specialties in an airy and inviting atrium setting. Cookies, scones, and packaged snacks are also available and make for a quick pick-me-up between meals. Saturday: 8:30 a.m. to 11 a.m.
La Loma Village’s private dining room offers the perfect setting for small gatherings and special occasions. The private dining room is available for reservations. 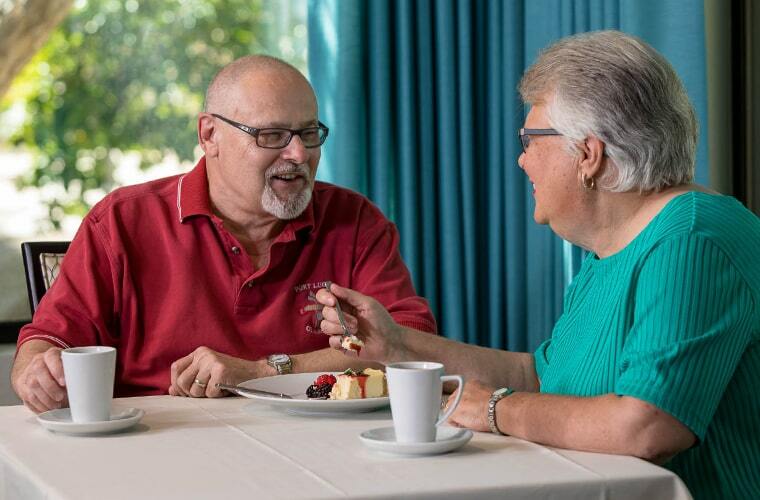 Residents can enjoy their meals outside on either of La Loma Village’s outdoor patios, located just off the Sonoran Dining Room and the Atrium Café. Both include exceptional mountain views and are open when weather permitting. Executive Chef Rodolfo Cardenas has 22 years of culinary experience. Chef Rudy earned his Pharmacy Technician Certification/License but chose to follow his passion for cooking after working at Sierra Winds as a Kitchen Manager. 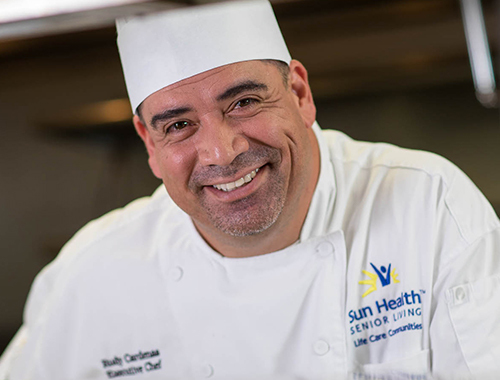 He then pursued his career as Assistant Director, Sous Chef, and Executive Chef while working at Morrison Community Living. Chef Rudy creates different style entrées offering a variety of flavors that will satisfy even the most selective of taste palates. Through making different types of dishes, Chef Rudy has had the pleasure of learning about different cultures and what encompasses them, which is what he loves most about being a chef. While Chef Rudy is crazy about seafood, and loves to prepare Paella, he also enjoys baking cakes due to the vast amount of flavor options and the opportunity to let his imagination run wild while decorating.